I hope you all had a great week and are ready to enjoy the long holiday weekend! I don't remember the last time Christmas fell on a Monday, giving us a 3 day weekend, so I'm pretty excited! Today's outfit is one that I hope inspires you, particularly if you want to get a bit dressed up for the holiday and add some slight festive touches. I totally get that going all out with red or green may not be everyone's cup of tea, but that doesn't necessarily mean the desire to be festive isn't there. The easiest way I feel to add a nice festive touch is with your accessories. I opted for a check blanket scarf that has some red in it, but you can also go for a red beanie or pair of shoes. If you're not feeling those ideas, you can always go for a red lip, which has a festive vibe this time of year. I hope you're all having a great week so far! So, to give you a little update on Aviah's sleep training, these past couple of nights, she's been sleeping in her crib at night! This is a huge victory for us because like I mentioned on Monday, it's been such an arduous task to sleep train her. With much persistence and consistency, we're making strides, what a sigh of relief! It was really getting to met that she wasn't sleeping as much as she should be before, so I feel so alleviated that she's catching up on much needed rest! A huge thank you to all of your words of encouragement, you're all awesome! I hope you all had a great weekend! As mentioned in my previous post last week, I have been working really hard on sleep training Aviah. It was real tough the first few days, but as I persisted in spite of all the crying, we've been making some huge improvements! We've decided to start the process of gradually, so I've been focusing on having her sleep in her crib during her daytime naps first. Prior to her napping in her crib, she'd nap in one of her swings we have set up in our living room. When she was a newborn, she'd be able to sleep for hours in it with no problem. Now, as she's gotten bigger and is more alert and attentive, any little noise wakes her, which has been causing her to get less sleep during the day. So, I figured it was time to transition her into her room. I mean, we did purchase a gorgeous crib for her, so she should be sleeping in it, right? Lol. 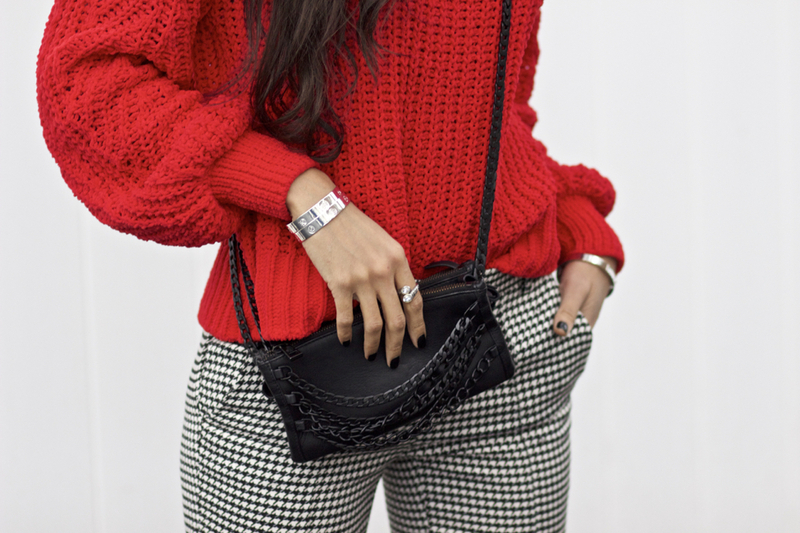 When this time of year rolls around, a combination I always think of and put together is red and houndstooth. It's not only a classic duo, but one that can be festive, too! Red has been the color this fall (as discussed in this post) and even more so as we're in the holiday season. It's one that's festive and looks great on everyone. 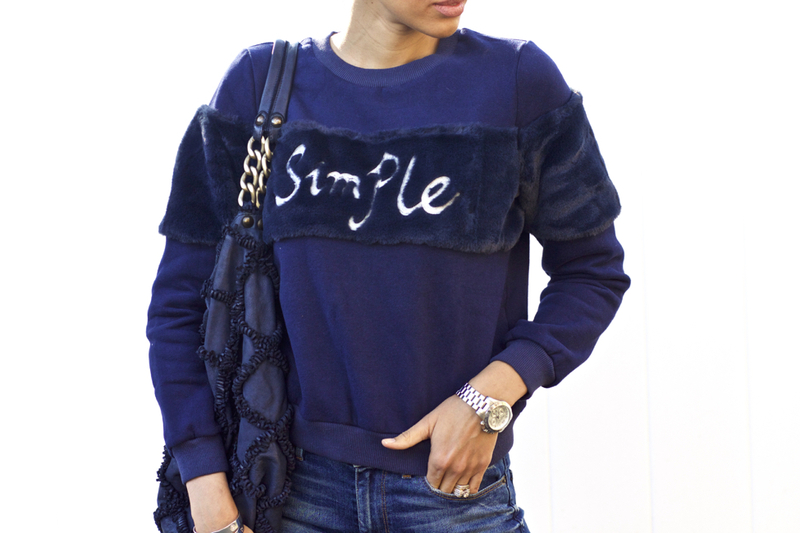 There are a couple ways you can mix up or recreate the combination to ensure a flattering outfit. Happy Monday my dear friends! I hope you all had a great weekend and are off to a great start to your week so far! Mine was a bit more relaxed than last, since we had our first snow! It wasn't much, so I was quite happy. Don't get me wrong, I love the snow, I just don't like the aftermath of having to navigate the roads. Did it snow where you live? I hope you all had a great week and are ready for the weekend! These past few seasons, the trends have been so good. What I've loved about most of them is that they've been bold in their colors and details, yet so practical for the every day woman like you and me to embrace. Many of them allow for us to wear them at work or on a more casual day, justifying each addition to the wardrobe. Or so I've been telling myself, haha. Tis the season of all things leopard! You all know that I'm a huge lover of leopard print, so I wear and embrace it all year long, but this is the time of year we tend to see it worn most, especially in outerwear. When it comes to styling, I'd suggest approaching it any other way you'd style a black coat, considering that leopard and all other animal prints are typically viewed as neutrals. How was everyone's weekend? Ours was so much fun! On Saturday and Sunday, we went to our town's holiday stroll. We moved here last year, so this was our second time going and it's really such a great time. Different food trucks come out, there are various activities all throughout the main shopping strip with a live nativity; it's absolutely beautiful! It was even better strolling around with Aviah; I still can't believe she just turned 5 months you guys, it's crazy how fast time has gone by. When I was pregnant, I felt like I was pregnant forever, but now I feel as though everything went by so fast. Today we're wrapping up my gift guide series, no pun intended. I was pregnant during the holidays last year and some of my family members gifted me with mom-to-be gifts that I thought were so cute. I don't know, something about receiving gifts from others before my baby shower that had to do with my pregnancy and baby made it that much more real and sentimental. Perhaps it was the hormones, but I loved it, haha!